Engine 80 is our first due apparatus for all structure fire responses. 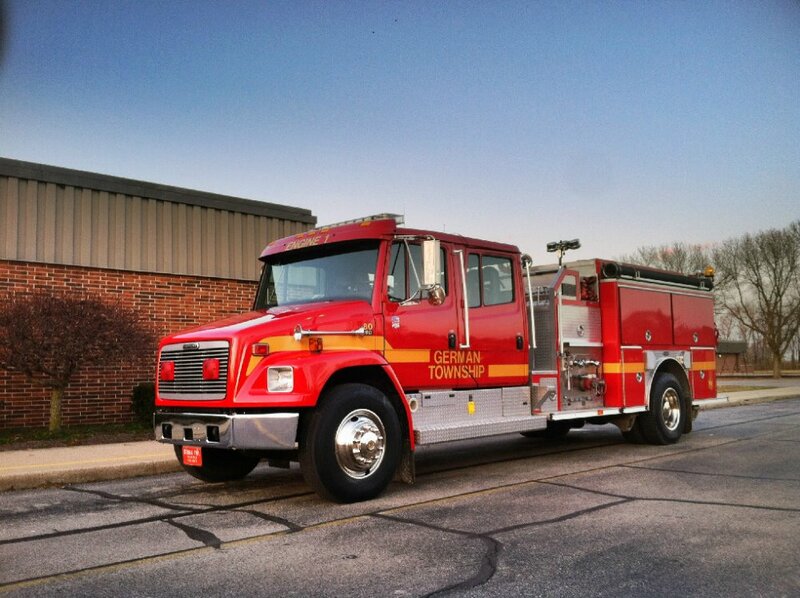 This 1996 Freightliner FL-80 chassis is complimented by a 1,000 gallon tank and 1250 GPM pump. This apparatus has seating for 5 personnel, which includes seat mounted S.C.B.A's, thermal imaging equipment, and all other equipment mandated by the N.F.P.A. Rescue 87 is our first due apparatus for all motor vehicle accidents, and 2nd due for all structure fires and EMS calls. Rescue 87 carries 1000 gallons of water, and qualifies as a "Class A Engine" per N.F.P.A. Standards. In addition, Rescue 87 boasts onboard, pre-connected, extrication tools as well as all Basic Life support EMS equipment. Tanker 81 is a vital piece of apparatus because of its ability to transport large quantities of water to the rural, non-hydrated parts of the township. This 1999 International Chassis can haul 2100 gallons of water, and uses a Hale pump. Brush Truck 88 was purchased in 2009 from Weise. Brush Truck 88 was a display model for the Weise Company, at the Fire Department Instructor's Conference (F.D.I.C.) in Indianapolis. Brush Truck 88's platform for wildland firefighting is exemplary! Brush Truck 88 has the ability to have front and rear mounted winches, a remote "Task Force" nozzle on the bumper of the truck to allow personnel to fight wildland fires from the safety of the cab. In addition, two, side mounted "whip lines" to allow personnel the ability to fight fire from the safety of the elevated pump panel. This 1999 Ford F-450 / E-One light rescue truck is designated as Intervention 83. Intervention 83 responds first to all Emergency Medical Calls for service, and carries all state mandated Basic Life Support E.M.S. equipment, which includes, an AED and portable suction. Intervention 83 is "second out" for all motor vehicle accidents, and carries on board extrication tools. In addition, Intervention 83 carries 500 gallons of water.